All hand sewn luxury 1920's kimono style dressing gown or jacket of double layer silk chiffon with wide Alencon lace flounce. Four silk ribbonwork appliques trim the front and sleeves. Each measures 3" by 2". The lace flounce in good clean condition measures 6" by 80". The garment measurements: back length 40", width at underarm 40". 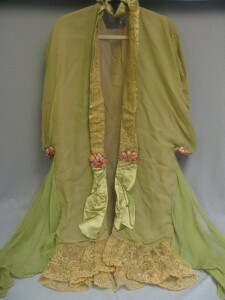 Condition is compromised with green silk ribbon splitting, and tears to the chiffon at the upper back. The condition is for repurpose or study with the ribbonwork flowers and lace trim in very good clean condition. I know, only one photo by the time I got to it. Actually, the seller deleted the photos early on because I did check a day after the auction ended and the photos were gone. Bah!